Don’t you just love a good giveaway?? Well, I have one for you today! 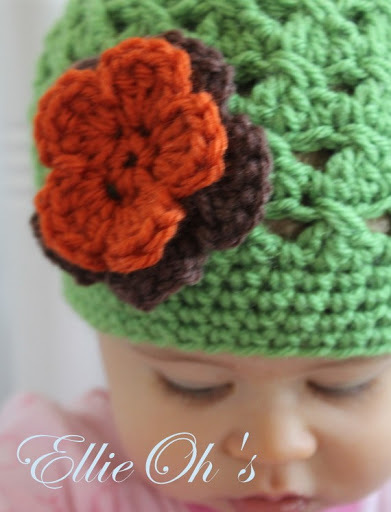 Carrie from Ellie Oh’s is offering a free crocheted baby/child hat for a lucky reader! 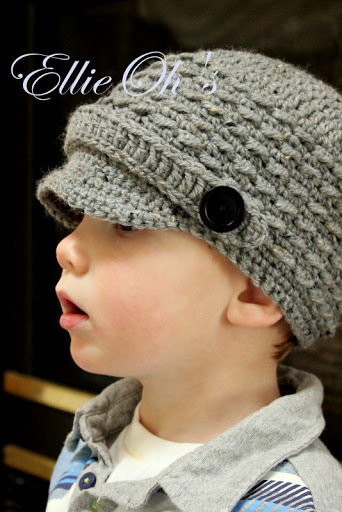 Carrie is a stay-at-home mom from Reading, Pa and she creates the most adorable hats for sale on her Etsy shop. She has some super-cute spring styles right now! Here is my munchable little Violet with one of Carrie’s hats. Seriously, is she not just so edible? I can hardly stand it. 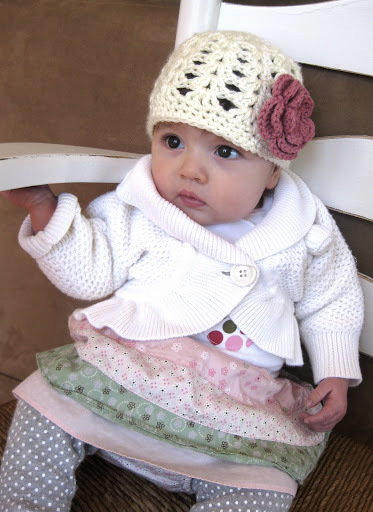 The hat is called “Breezy Beanie” in ivory with a detachable raspberry flower. So stinking cute, right?? 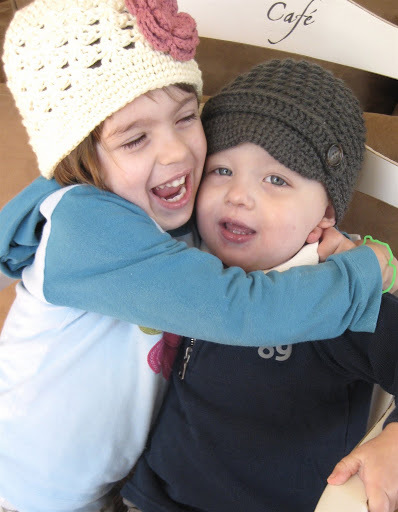 And here are Avery & Jack with hats of their own. Can I just tell you how difficult it is to photograph a two and four year old?? Sitting still is just plain impossible! 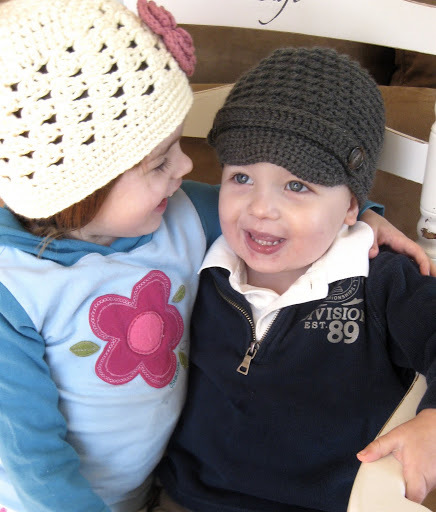 Avery has a “Breezy Cloche” hat that matches Violet’s, and Jack is wearing a “Newsboy” cap in slate gray. Ok, so here is how you can win one of your own! If you don’t have any children at home right now, they make awesome gifts! 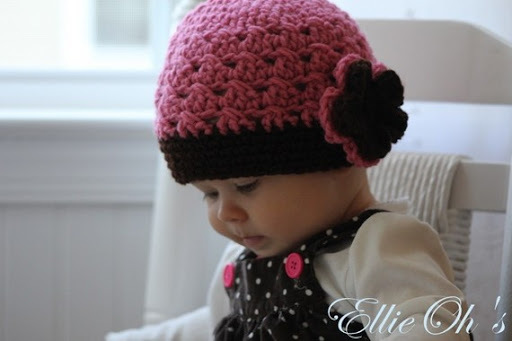 To enter, visit Ellie Oh’s Etsy shop and leave a comment here telling us which style you would like to win. For an additional chance to win, write about this giveaway on Facebook or Twitter and come back here and leave another comment. 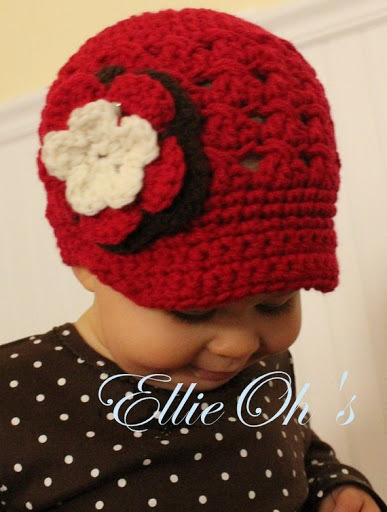 For a third chance to win, “like” Ellie Oh’s on Facebook and come back here and leave another comment. Giveaway ends on Friday, March 11, and the winner will be chosen randomly. Carrie is generously offering 20% off to my readers by entering “AIMEE” in the coupon code section at check-out.